Maggie (center) Taking notes on peach tree pruning. Which is a plus, because pruning can seem quite intimidating, with talk about sizing, different cuts, pruning for growth, pruning for fruit, dwarf trees, semi-dwarf trees, two-year fruit vs four-year fruit. The ideal angle of branches. At times, avid orchardists can forget there is knowledge and terminology that the average (or novice) fruit tree owner doesn’t know. It can be quite dizzying. Ann will spend two full hours teaching and demonstrating the simple logic of pruning: how to prune for short stature and easy harvest, seasonal routines, and pest and disease control. Because unless you do care for an orchard as your main activity in the day, most backyard caretakers will only be able to do what works for them. Have you registered for our upcoming winter fruit tree-pruning workshop taught by author and educator Ann Ralph? 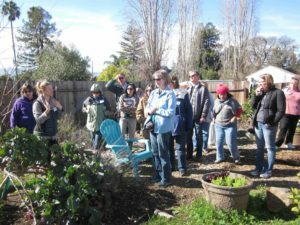 The February 11th workshop, which will be held at the Benicia Community Orchard, is a great opportunity to learn the basics of fruit tree pruning.